This year's "Acropolis" tournament, held at the beautiful city of Chalkida from the 10th to the 18th of August, enjoys the participation of the Indian Grandmaster Humpy Koneru. 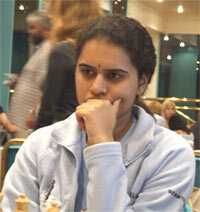 Humpy Koneru was born on March 31st, 1987, in the city of Gudivada of Andhra Pradesh, in India. Today she is the second strongest female player in the world according to ratings (she is rated 2623), with only the famous Judit Polgar above her, and at the same time only the second female player to have surpassed the 2600 barrier. Humpy was initially called Hampi (sharing this name with an ancient city), but her parents later changed her name to its current version. She was the holder of the record for the youngest Woman Grandmaster since 2002, a record obtained at the age of 15 years, 1 month and 27 days, thus improving on the record of Judit Polgar by three months. Today this record is held by the Chinese Hou Yifan. In 2001 she won the World Championship for Girls Under 20. 2006 saw her first participation in the Women's World Championship, where she tied for third place in the 2008 edition.